Just before I got heavily into table top games, my brother (who has spent thousands over the last few years buying them) showed me one that blew me away. In amongst games of Dead of Winter, Colt Express, and Camel Up, he showed me Betrayal at House on the Hill. The game itself is very simple and doesn’t require much thinking, at least at first, but as the game goes on and the inevitable Haunt occurs and triggers one of a possible 50 different scenarios to begin, nine times out of ten causing one of the other players to become an enemy, and then it takes a different turn all together. The idea of Betrayal is that you are a group of characters exploring a haunted house. As you go discovering rooms (by drawing house tiles from the stack and building the house plan as you go room by room), you gather equipment, take damage, build up your character a little, and experience spooky phenomenons during your adventure. Eventually a certain circumstance reveals what scenario you are going to play and the real game begins. Although sometimes if it is revealed too early, or you do not have enough characters, or if just a generally crap Haunt has revealed itself, it can be a little disappointing and leave your game with a bad lingering taste afterwards. An expansion pack has been brought out that I have which tries to cater to a few of these issues, as well as adding in an additional 50 haunts! But sadly this game can be a bit of a misfire. That isn’t all the time though, as a lot of the times you will have a great bit of fun with this game. I haven’t explained much of how the game is played as the above section focused solely on the original game, we are not here to talk about that, instead we are talking about the spin off game Betrayal at Baldur’s Gate. Now any D&D fan, or classic RPG video game lover, will know that Baldur’s gate is a legendary place set in the Dungeons and Dragons world. So it is clear that this version of Betrayal was heavily D&D themed. I picked it up for Christmas and have played a couple of games since then, not as many as I would have liked, but I am sure that I will get stuck into a few more in the next few weeks. The core of BaBG remains the same as the original. At times it does feel like a complete reskin of the original game, however the different locations (going inside buildings, around Baldur’s Gate, and into the catacombs) do make it feel like a completely separate experience. Here, instead of picking a random hero whose Mental and Physical traits are the only distinguishing feature, we can now pick pre-made characters from various classes throughout the D&D world. Both of these characters are double sided, so you may have a Human Wizard on one side, and a Human Sorcerer on the other, and each one features a special ability that you can use during the game. Any D&D player will know that Bards have a lot of good boosting spells, and in this game it is no different. The Bard here has the Bardic Inspiration, which allows a player three spaces away to carry a token on them to allow a +1 to any tests that they may roll. 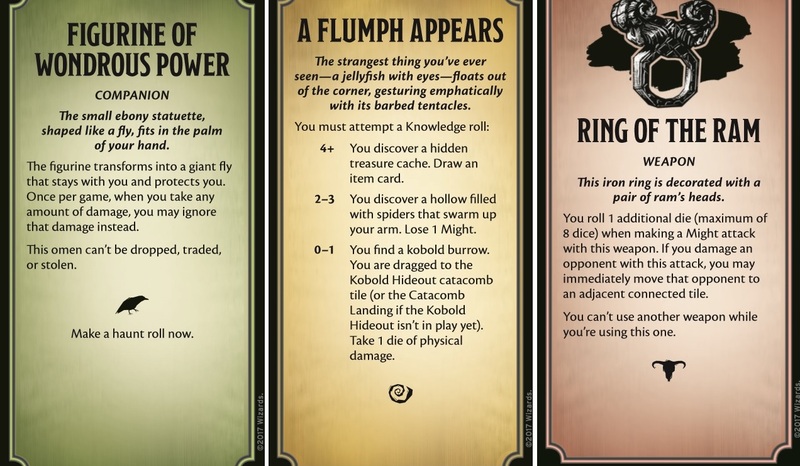 These test occur from cards drawn from new locations, or possibly part of the objective depending what Haunt you are playing (is it still called a Haunt in this game? I can’t remember). These special abilities do really come in handy and mix the game up nicely from the original. Once you have chosen your character you begin the game like all good D&D campaigns, in the tavern! 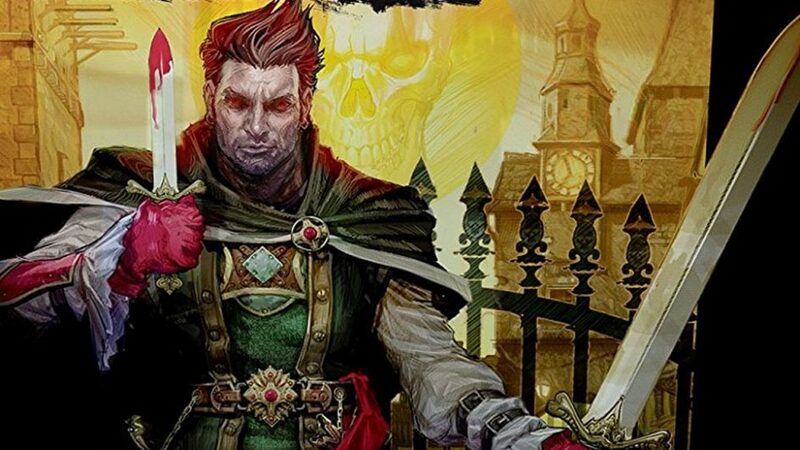 Here you are free to explore Baldur’s Gate and get yourselves into trouble. Instead of things like a haunting experience occurring, then events that transpire are more along the lines of the theme, so you may be attacked by bandits, or goblins, or you may discover a chest and depending what number you roll on the dice depends whether the chest was a mimic or had a great treasure inside of it. So it works really well with this style of game. Exploring is fun, as you can either search inside the various buildings of Baldur’s Gate, such as the weapon shop or the mansion, the city streets – including the executioners block, or head down into the sewers and catacombs beneath the city. 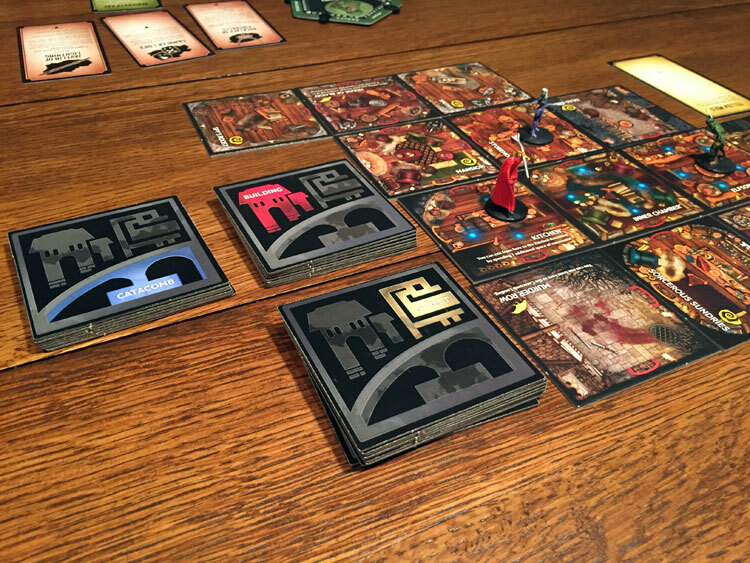 You are able to use any tile with a sewer grate as a transport to get you down into the catacomb entrance in one turn, which was a nice thing they add into the expansion of Betrayal at House on the Hill which allows you to travel between rooms (an issue from the base game). Speaking of which, another thing they have brought over from the expansion is that there are a lot of tiles with abilities on, such as ending your turn here once per game – gain a Knowledge point, or ending your turn here, lose 1 point of mental damage. You also have the tokens for the various characters to lay onto the cards to indicate that you have already used up that ability. 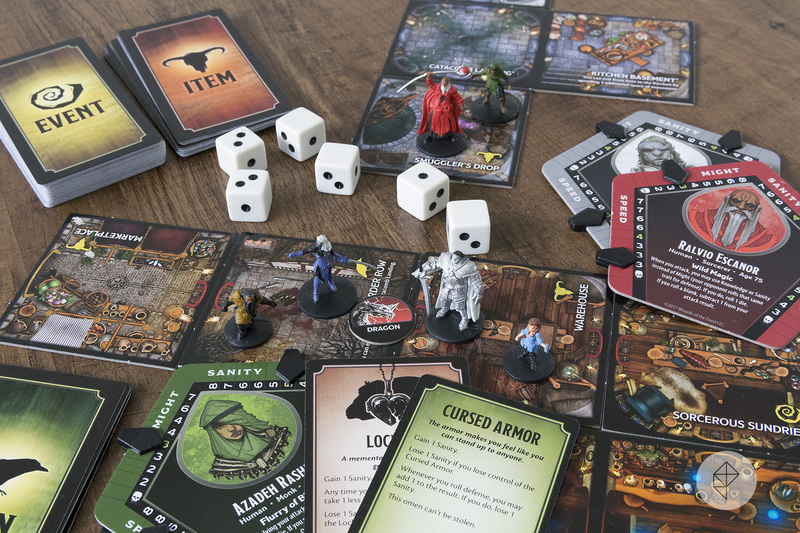 Instead of rolling 6 dice every time a location is revealed with an Omen icon and scoring less than the number of Omen cards out, now you roll as many dice as there are Omen cards and need to score a 6+ in order to make the Haunt occur. This means that it does take longer for the Haunt to be revealed, as sometimes in the original Betrayal game, the Haunt can occur far too early and cause massive issues for the good guys. It pretty much assured victory for the bad guys as it makes it near impossible to succeed. It is very rare, but possible that you can reveal the Haunt on the first Omen card if you roll all the dice as blank results, where as with this game, it can only be on the third Omen card minimum because there simply isn’t enough cards on the dice. I feel that this rule can be taken over to the original Betrayal as well to make that game work better moving forward. With 50 brand new haunts to be had, the game still offers the great sense of replayability that the original had. Once the Haunt is revealed, the Omen card and the room tells us who was the Haunt revealer (aka the Betrayer) who now has to go off and read his own objective, while the rest of the characters read theirs. There are a lot more enemy involved Haunts, as there are more enemy tokens that previously, but given the D&D feel it suits it. The one we played recently had the betrayer trying to bring about a death curse to the city and was causing anyone who did not have the amulet on them to lose 1 point of physical damage per turn. Thankfully a new game mechanic helped us try and gain the upper hand, as in this game you can now steal items from an enemy so long as you have dealt two or more points of damage. This can be used in amazing ways, as there are cards that slow you down, which can be given to enemy characters to help you in completing your own objective. The greatest card in the game is clearly The Shiny Rock, which allows you to trade with a player and swap it for another card, and the other player cannot refuse. This can be used nicely to get exactly what you want, but you’d need to get out of there quick as they would be after you to get it back and do the same to you. Anyway, overall Betrayal at Baldur’s Gate really is a reskin of the original game. If you are a fan of Betrayal at House on the Hill and want to play more of it in a completely different setting, with a whole load of new Haunts (not that you would really have done all the other ones, especially if you had the 50 extra ones with the expansion, and given that the map changes every map, you really do get your money’s worth with just the base game), then this game is for you. As with the original game, the Haunt being revealed too soon, or not being well enough prepared for when it does come, can cause some painful issues and make some of the games feel a bit of a let down, but more often than not, you will have a rather enjoyable time playing this the same as you might have done with the original game. If you have never played it and you would rather choose this D&D themed version over the Haunted House one, then you will not be disappointed, nor feel as if you are missing anything. 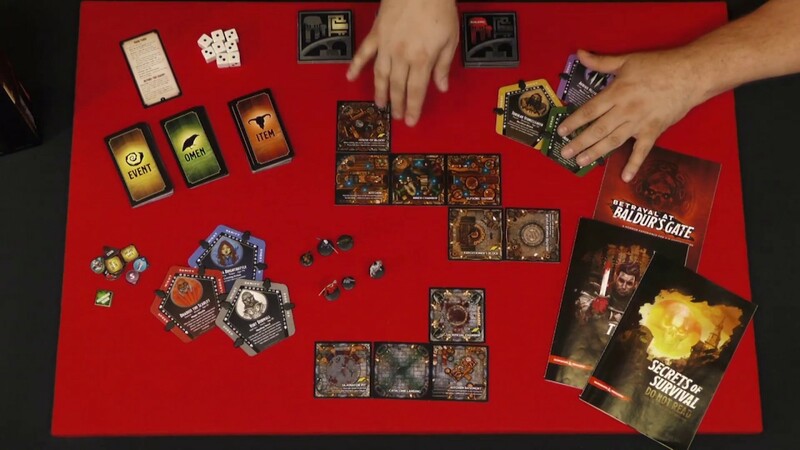 In fact you might even be better off as you would be missing out if you just bought the core version of Betrayal at House on the Hill, as it would not offer the mechanics brought in through the expansion, which are already implemented into this game. I am looking forward to getting involved and playing a few more scenarios of this game, and so it is clearly doing something right. Of course this is just quenching my thirst until they bring out the recently announced Betrayal Legacy, which, as you may or may not know, is a game that evolves over the course of the campaign and once it is done, it is done! As you rip up cards, stick things onto the board (tiles in this case), give characters abilities, add new objectives into the game, and all sorts of other things that mix the game up as you continue to play it. In case you did not figure it out, I am very excited for this.